My name is Willie. I am a 7 year old male I could lose a few pounds as I am 32lbs. That may help my snoring issues some too. It’s kinda embarrassing so don’t tell anyone ok? 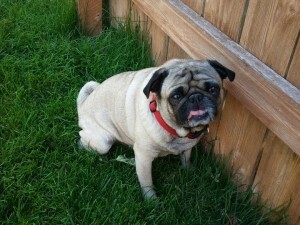 I’m at the vet getting neutered but I will be at my new foster home giving pug snorfles and licks soon. Check back on me soon! Willie has been a gem from day one. He fits right in with our family of two male pugs, two cats and two kids. He gives the cats a passing sniff, and goes along with whatever the other pugs are up to, or just sits and watches. The kids can easily walk him. Willie is a laid back, go with the flow, regular fella. He enjoys the backyard and does stairs with no problem. He does his part to keep the birds out of the back yard and sometimes barks at thunder. He loves humans and follows us around; always happy to see us. He sleeps in bed with us or at our feet. He does not jump on furniture often. From the start Willie has been doing well with going potty outside, but occasionally we have marking in the house. He is very handsome and has lots of wrinkles; looking good at 23lbs these days. Simply put, Willie is a great dog!